Die Geschöpfe des Prometheus, Op. 43 � Overturea (1801) [4�37]. Symphony No. 2 in D, Op. 36b (1802) [29�41]. Les Troyens � Marche troyennec [4�45]. Aufforderung zum Tanz, J260d (1819) [9�08]. Symphony No. 3 in F, Op. 90e (1883) [39�48]. Symphony No. 39 in E flat, K543f (1788) [24�44]. Rienzi (1842) � Overturec [9�58]. Siegfried Idyllg (1870) [15�41]. Les Préludes, S97h (1848) [14�43]. Mephisto Waltz No. 1 (Der Tanz in der Dorfschenke), S110/2h (1861) [10�38]. aWiener Philharmoniker, bhLondon Symphony Orchestra, cOrchestre de la Société des Concerts du Conservatoire, defgLondon Philharmonic Orchestra /Felix Weingartner. Bravo to EMI for putting together such a fascinating twofer. I well remember my first acquaintance with Weingartner�s recordings (an HMV RLS release, I believe, a boxed set with a very lurid green cover). This set acts as a timely reminder of Weingartner�s greatness. Felix Weingartner was born in 1863, studying in Graz and then Leipzig (with Reinecke). He succeeded Mahler at the Vienna Opera (only for three years), but held his ties with the Vienna Philharmonic until 1927. He met Wagner (fleetingly). Weingartner died in Winterthur in 1942. Weingartner was much associated with Beethoven (even publishing a book, �On Conducting and On the Performance of Beethoven�s Symphonies�) so it is entirely apt that the set begins with two works by the Master. Prometheus opens in a perhaps (these days) weighty (nay, portentous) fashion � yet how this contrasts effectively with the scampering violins of the main body of the Overture! Perhaps the fortes could have a touch more vim, but this remains an arresting reading. Christopher Dyment�s annotations tell us that this take has only previously been available in Japan � we should be grateful to be able to hear it. Weingartner attacks Beethoven�s Second Symphony as if he had never heard any argument against it being one of the greatest of that composer�s symphonic canon. There is an energy to the Adagio molto introduction that is lacking (in this measure, at least) in every single other account I have ever heard, an energy that spills over unstoppably into the Allegro con brio, making the contrasting, �wind-band march� arpeggios all the more effective. The first movement leaves the listener breathless � yet this is breathless with admiration, rather than short-windedness. Occasionally one feels that if this had been with the Vienna Philharmonic such moments as a certain blurring of cellos and basses at 6�57 would not have occurred, but this remains an involving experience. Some may find the Larghetto a little unyielding (there is something of a 3/8 March about it) � no such caveats about the Scherzo, which dances along. More, Weingartner brings out the modernism of Beethoven�s juxtapositions, emphasising the freshness of invention. The occasional scrappiness in the finale is more than adequately compensated for by the orchestra�s way with trills, which positively buzz with energy. The Berlioz Marche troyenne works quite well. It just sounds as if Weingartner is trying to impose hoch-Deutsch ideals on music with a fundamentally Gallic heart. The Weber (Aufforderung zum Tanz) begins with a simply superb cello solo (LPO this time). Some of the main body of the work tends towards the scrappy, but there is plenty of spirit in evidence. Finally on the first disc comes a Brahms Third from 1938 with the LPO. Weingartner, it should be remembered, heard Brahms himself conduct the Third Symphony in Leipzig and the Fourth in Hamburg in 1888. The composer was impressed by Weingartner�s handling of his Second (which Brahms heard in Vienna in 1896). It is perhaps surprising to note that the first theme does not quite explode out of the initial chords � it is more of an organic growth from them. Weingartner�s grasp of the score is sure and he lets some wonderful, tripping moments shine through, contrasting and juxtaposing them with real Brahmsian warmth (especially from the strings). Wind tuning is not always completely secure, however. The intermittent glow of the first movement grows to a warming hearth-fire in the second and third. The finale is notable mainly for a supreme sense of subdued urgency. Everything has a point, nothing ever �sags� (as it can so easily do in a lesser conductor�s hands). Mozart�s Symphony No. 39 opens the second disc. Weingartner himself referred to the fact that �Olympian grandeur streams through the majestic introduction� and there is indeed a seeming inevitability about the arrival of the Allegro. The strength of this Allegro together with much excitement is tempered by an aura of gentilité (in this sense it reminded me of Giulini). The care lavished on the Andante con moto is quite remarkable (strings are preternaturally together), while the Menuetto has a Trio fully evocative of Bavarian Lederhosen. The finale bristles with energy � the dark colourings along the way remind the listener that this is very much a multi-faceted work. Weingartner met Liszt in 1882, joining his circle in the years 1883-86. Frederic Lamond found Weingartner unrivalled in his interpretation of Liszt�s music, and the two works here give no cause for doubt. Les Préludes unfolds with a real sense of drama. The opening exudes a real sense of mystery. Never once does the music sound hackneyed (and it can, in lesser hands). The LSO seems to be on top form, as the depth of the string sound comes faithfully through the years (it was recorded in February 1940). There is a silken delicacy to strings and harp (around 8�45) and, later (11�20) magnificent warmth from the cellos. Weingartner�s conception seems unshakeably right. From the same sessions on the same day comes Das Tanz in der Dorfschenke (the orchestral version of the First Mephisto Waltz). Most recently I heard this live with the Budapest Festival Orchestra under Iván Fischer (review) . On that occasion I voiced doubts as to the arrangement, referring to the edge being rubbed off the percussive original. Weingartner has no qualms � this is a whirling dervish of a performance, the basses of the opening positively primal. This really sounds like the Devil�s music, including the more seductive sections where suspensions really ache. Portamento is there, but always used to expressive ends. The extreme excitement of the work�s close comes as no surprise, yet it is an apt end to a superlative twofer. 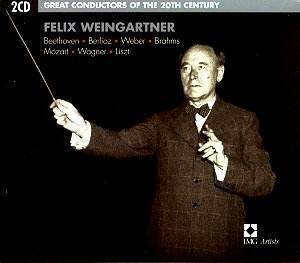 If you buy only one set of the �Great Conductors of the 20th Century� series, may I humbly suggest this should be it.